This casual piece can be used as a sofa table and is also a great piece in the dining room as a serving table. 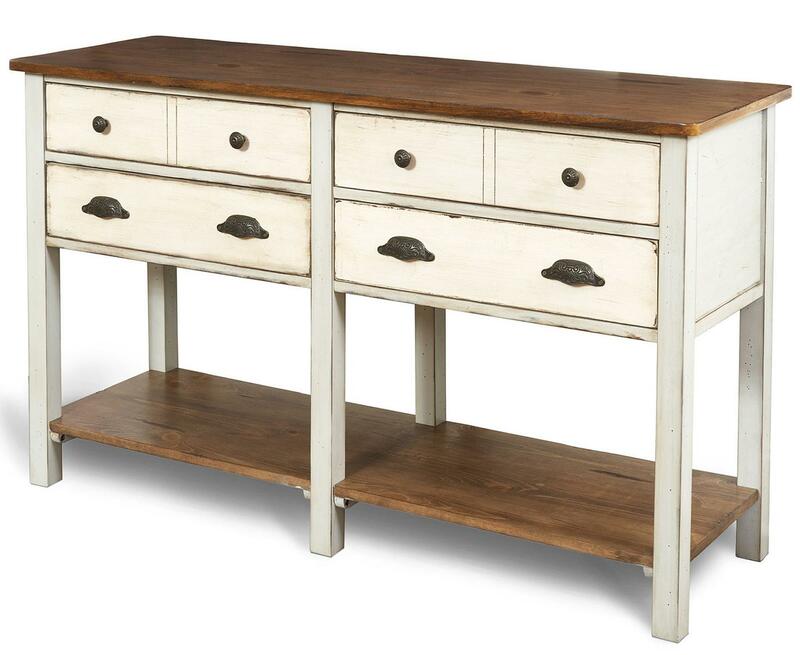 With four large drawers, this console offers a variety and abundance of storage availability. It's light finish is complemented by accent drawer pulls and knobs in an antiqued finish and decorative details. A variety of wood tones take this simple designed wood console and give it character and excitement. The Chateau Two Tone Sofa Console with Ample Storage by Flexsteel at Zak's Home in the Tri-Cities, Johnson City, Tennessee area. Product availability may vary. Contact us for the most current availability on this product. Warranty Flexsteel warrants against failure or breakage for the lifetime of the product, while upholstered in the original fabric, under conditions of ordinary use, for as long as the original purchaser owns this furniture. The Chateau collection is a great option if you are looking for Cottage furniture in the Tri-Cities, Johnson City, Tennessee area. Browse other items in the Chateau collection from Zak's Home in the Tri-Cities, Johnson City, Tennessee area.